This table cover fit perfectly and looked fantastic. The festive red white and blue stripes were very pleasant to look at and not at all gaudy like some can be. Purchased this as a gift for a friend and they loved it, especially the zipper which made application so very much easier. The tablecloth was a perfect fit especially with easy on off zipper, looked great and company love it. I am buying another in a different pattern. I love the look, the ease of it and protection it gives our tables that are always outdoors. 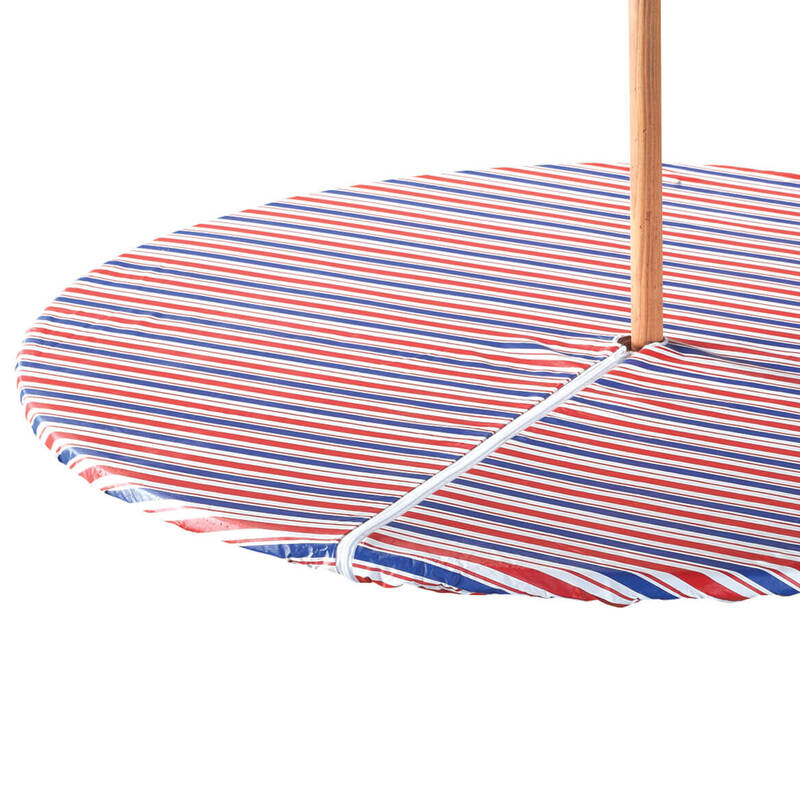 This patriotic table cloth is great for holidays and it covers my old table top. These are great for parties! Easy to put on and remove! 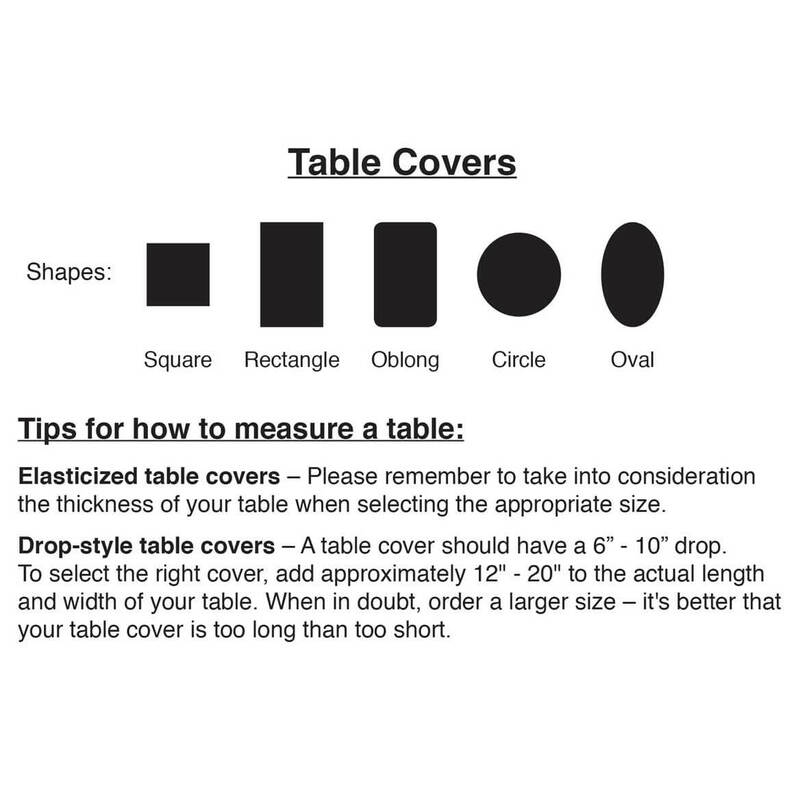 you don't have to remove your umbrella to place I on you table. 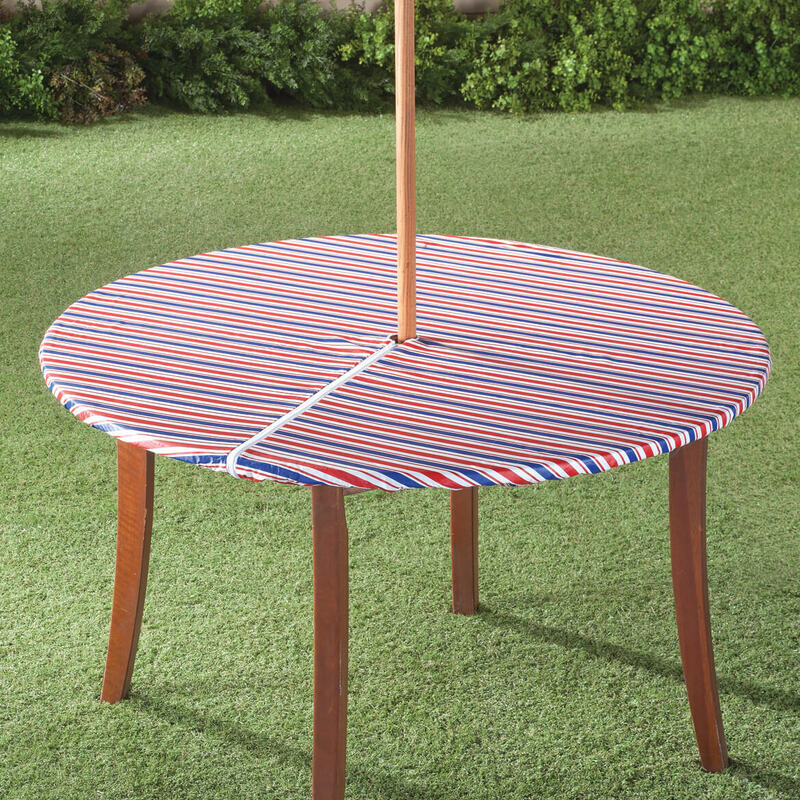 Difficult to find fitted tablecloths for our patio table, so when I saw this, I ordered it. pretty---and wanted a table cover that the wind would not keep blowing up and away. Good price helped to decide also. I needed a new outdoor table cloth. My patio table needed sprucing up and I'm hoping this will do the trick. I wanted a zippered elasticized cover and luckily found one here that appears nice. My table is 42" in diameter so hoping this will be a good fit. I needed 2 tableclothes that were elasticized with a zipper and hole for the umbrella. I had a hard time finding these~so glad you carried them! Could not find a similar item from other sources. These are the greatest; have had a green one for YEARS; getting this one for 4th of July and summer!! I got my neighbor one and she nearly lost her mind; loves it too!! This cloth appears to be made like the ones I've ordered before except it's lacking the gold stripe. So I'm ordering two for this year's Independence Day pool party! I have not seen this anywhere else. I love the red, white & blue design. The zipper will make it easy to put on & take off. 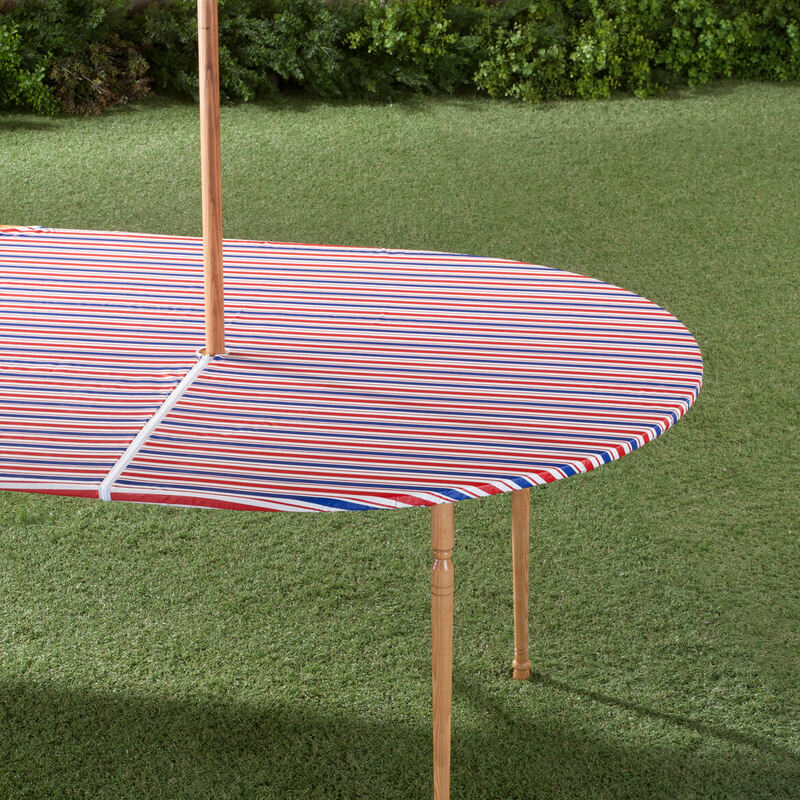 The elasticized edge will keep the wind from blowing the table cover up. Exactly what I was looking for. I chose this item because I have a picnic table with an umbrella. This item will cover the table and I will not have to cut an opening for the umbrella. I like this item because it doesn't end up on the table in a bunch when the wind blows and no clips to fuss with. Thanks for caring this item. Size and colors were what I wanted. I chose the elasticized patio table covers because those without elastic are subject to being blown by the wind. I ordered this table cloth for my patio table. It will be nice for the 4t6h of july. Can never find what I want at local stores. I liked the pattern for the Fourth of July cookout. Fits into our patriotic decor on our deck. I live in a windy state and these elastic table covers never fly off my outdoor table. A perfect fit for where I live. I have purchased these before and they are great, especially in a windy area.